Don’t forget to enter the giveaway! It will be closed down at midnight tomorrow night- Saturday July 7. I have a BEAUTIFUL combo for you today! I can’t remember where (I’m so sorry! 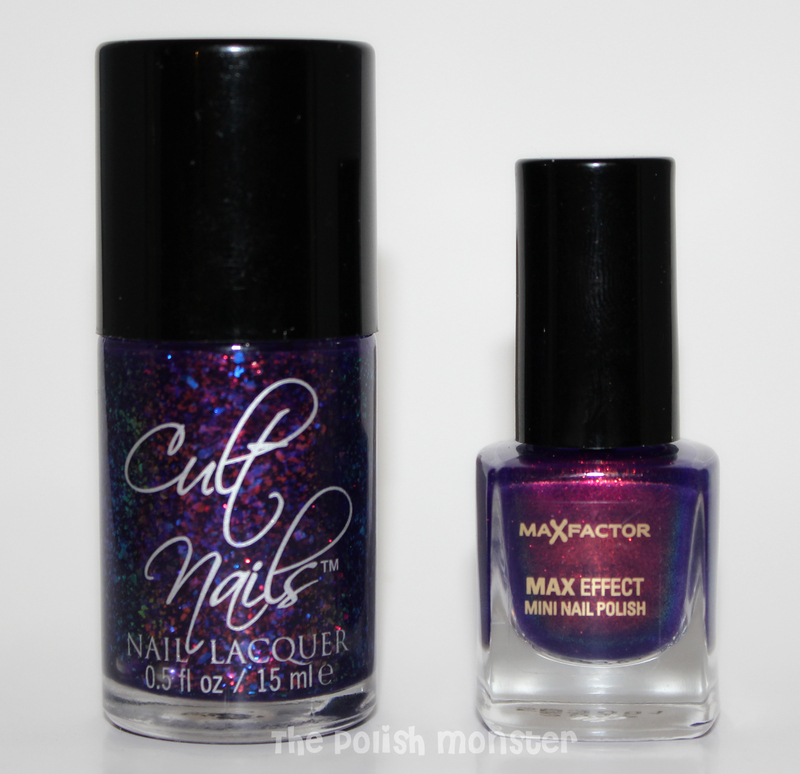 ), but I’ve seen a few people combine Cult Nails Seduction with Fantasy Fire from Max Factor- WHAT a gorgeous pairing! 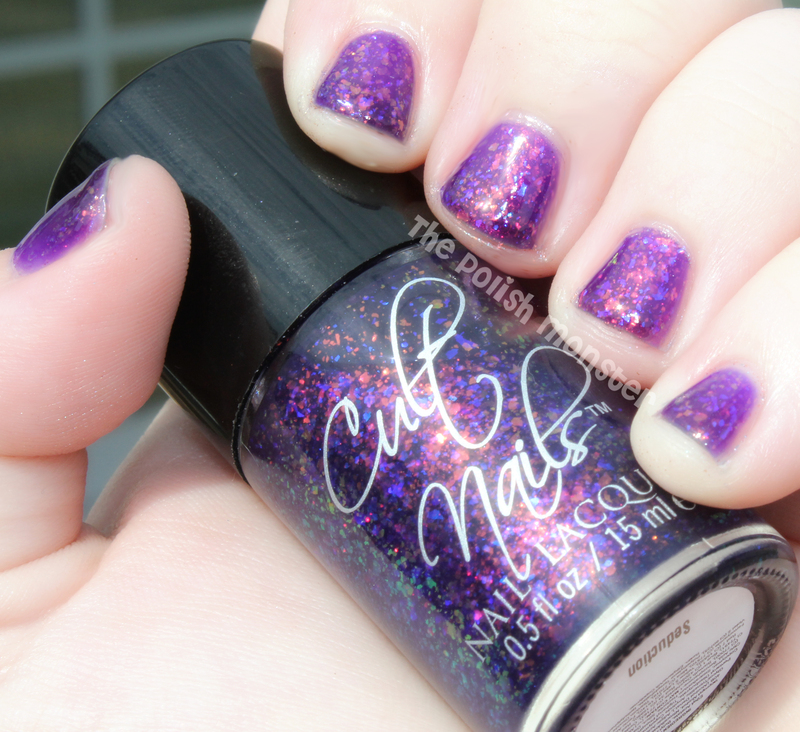 For those that aren’t familiar with either polish, Cult Nails Seduction is a limited edition flakie that can be found on Cult Nails site for $10. If you want it, I highly encourage you to get it while you can! I can’t being to talk about how much I regret not getting Toxic Seaweed before it was discontinued… and of course I would give my right arm for Clarivoyant. 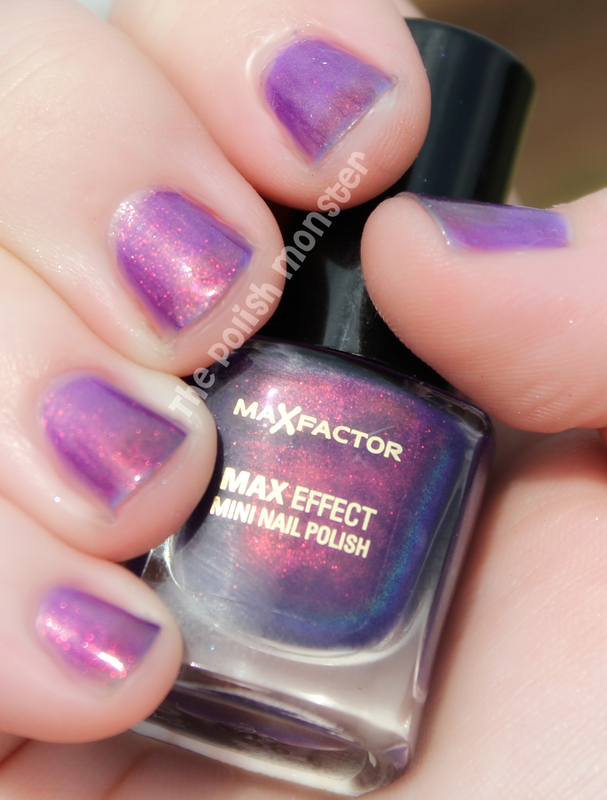 Max Factor Fantasy Fire is sadly only available in the U.K., and only in mini size. So if you’re anywhere else, you’ll have to find a swap buddy or head to Ebay. I used a U.S. seller on Ebay with a high rating, and for a reasonable price (well, sort of reasonable). Fantasy Fire is highly sought after due to its similarity to the illusive and no-longer-available Clarins 230. It’s a STUNNING multichrome in a bright purple base. This was actually my first time using Fantasy Fire for a full mani, and I made the mistake of NOT layering it over something. Ladies, don’t repeat my mistake! While gorgeous, Fantasy Fire is fairly sheer. In the picture below I have on 3 coats- and you can still see my nail staining (it makes the multichrome effect show up differently). Notice the little ovals of a different color at the tips? That’d be my staining- it’s almost grown out. I hated to cover up such a pretty color, but I did. While Seduction covers up a lot of the beauty of Fantasy Fire, layering them together gives a gorgeous shimmering depth to the polish. Cult Nails really does flakies well. Clarivoyant is absolutely STUNNING, and so is Seduction. The flakes are thick, dense, and very colorful. Seduction has a strong orange to blue-purple color shift in a sheer purple base. Just look at that beautiful bottle shot! Overall I liked this combo, but next time I may try more of a flakie-sandwich with Fantasy Fire, because I think FF got a bit too lost in the flakes. For what it’s worth, even with Seduction on top, I CAN STILL SEE my staining. It just shows up as black shadows on the tops of my nails. I just can’t win! This entry was posted on July 6, 2012 by The Polish Monster. It was filed under Uncategorized and was tagged with Cult Nails, Fantasy Fire, Flakie Friday, flakies, Max Factor, multichrome. oo these are both stunning!! mm it appears like your site ate my first comment it was super long so I guess I¡¯ll just sum it up what I submitted and say, I¡¯m thoroughly enjoying your blog. I too am an aspiring blog blogger but I¡¯m still new to everything. Do you have any helpful hints for inexperienced blog writers? I¡¯d definitely appreciate it. I’m sorry it ate your comment! I’m glad you’re liking the blog! As far as helpful tips- I know a few bloggers were kind enough to tell me things, so I’ll try my best! The biggest tip was to be yourself! Another great tip was promoting your blog, but without being obnoxious about it. Like- don’t spam your blog link on everyone’s pages, but do link up anytime people ask for links on pages of the brands you’re featuring, etc. And try to have fun with it! People can usually tell when you’re enjoying what you’re doing, or just in it for what you can get from it, etc. OMG! I loooooooove Fantasy Fire! It’s one of my lemmings! Very nice pair! Fantasy Fire is SO pretty! I actually just parted with it to acquire RBL Scrangie- but one of my big birthday presents this year was Clarins 230, and I have Darling Diva Polish’s Ringer, so it helped a little 🙂 Ringer is identical, except that it’s a bit more sheer. I LOVE the purple shade on FF! It’s available in my shop and Im located in Florida. Search: alarenay on storenvy.com I’d be happy to give them a home!